Coldstream MAX water purifiers are the best performing ceramic water purifiers available. Made in the UK. The Coldstream MAX water purifier provides the ultimate in protection against water pollutants, waterborne viruses and delivers great tasting water too – it is made up of three key components. The carbon inner core protects against chemical contamination, including pesticides and herbicides. Surrounding this is our unique ceramic outer layer giving maximum anti-bacterial protection and the removal of particles and microplastics. Finally, we add a duck egg blue ceramic outer layer containing antimicrobial properties, which helps to eradicate any waterborne viruses, providing maximum protection against all water pollutants. CF504W / CANDLE / L 9.5" Dia 2.1"
CF520W / CANDLE / L 9.1" Dia 2.9"
CF521W / CARTRIDGE / L 10" Dia 2.75"
Heavy Metals 99.9% removal of heavy metals including lead and mercury. For arsenic* removal, see performance data sheet. Virus 99.99% removal of viruses and disease-causing micro-organisms, like Rotavirus. Pesticides & Herbicides 99.9% removal of pesticides and herbicides, including DDT. Pharmaceuticals 99.9% removal of pharmaceuticals. The Coldstream MAX water purifier provides the ultimate in protection against water pollutants, waterborne viruses and delivers great tasting water too. 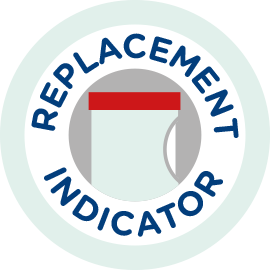 The unique replacement indicator is shown on our packaging. The blue ceramic outer layer contains antimicrobial properties which help the filtration process. As the filter is cleaned, the blue layer is removed until the white ceramic is exposed, indicating time to change.